Judging from the final result of this photo shot at picturesque Burano (Venice), you would imagine that all the time of the world was at my disposal to make this picture of utmost calmness. It is almost obvious that the absence of any distractions whatsoever, was reflected at my eyesight and then to the quiet moment that I chose to capture. I could have leisurely taken my spot, delving concentrated into another moment of loneliness that contributes to deep thoughts, and then to photos. But -as known- reality is harsh, for this photo was the result of an anxious search for the best point in the island, including some instances of fast-paced run I shall admit! You see the boat that brought me to Burano, had intermediate stops that I did not plan! I was there barely on time to set up tripod. And then I had company! And I mean quite a large company bugging me from my self-inflicted mission! A bunch of little Italian boys and girls, kids in their early school years, were playing along the canals of this magnificent fishermen island, a few meters away… Kids’ curiosity is of course notorious! Spotting me with my bulky bag and tripod while selecting my spot on top of their wooden bridge, probably triggered some of their most sociable neurons. They all run to my place on the bridge, some 10 or 15 of them! It seems I was becoming part of a game that they played with tourists! Their sincere eyes and the tone of their questions probably triggered my own childish neurons (if any left!) deep in my own mind. I had decided to play their game! My role, I supposed, was to let them find by themselves where I was coming from. “No, i miei amici!” I responded in bad Italian, taking turns in their game! And then there was this bees-like assembly, with various nationality-words being thrown on air, in Italian. Every now and then, another question arose as if a decision was made: “Spagnolo?”, “Francese?”. My negative responses where becoming even more anxious…. but not due to the fact the “Greco” was not an obvious choice for my little neighbors… I was eager to participate, yet I was losing the click for the light that I planned, with tens of kids around me asking words! I juggled between answers and camera settings, letting half my brain respond to the game and the other half making aperture adjustments. Two clicks were my only harvest from this beautiful point while praying to have made the right camera choices through this game! Yet, my little friends kept asking and asking with increased speed, as light was taking its final dip behind the colourful fishermen houses. “Greco” I said, and suddenly the game was over!…..
One of them, a little boy that had probably guessed right, was the winner! He raised his hand in celebration of his victory, even though he was never heard aloud! They acknowledged the result and all together, the fifteen of them, started to run in great speed to the place they had come from, the victorious one in front with the hand still up reminding his victory at this great game! It was my turn to pack my equipment and continue my stroll, following the other direction of the bridge. I heard a very loud “Grazie” from the last kid of this swarm, while he turned to me to thank for enlivening their game. “Grazie”, I responded and continued my walk. Too pity that I was not sure whether I could also raise my own hand to celebrate a great picture. I was distracted, yet I enjoyed, and my sole two photos from the wooden bridge could not be judged until later, while at the hotel. A lonely photo, it was not! This entry was posted in photography, Yannis Larios | Greek Travel and Wedding Photographer and tagged Burano, Burano photos, Italy, Italy photos, travel, Veneto, Venice, Venice photos, Yannis Larios photography. Bookmark the permalink. ← Can you imagine what a travel photo entails? Oh my, your story is sooooooo magical. I was with you through it all! HAHA.. the school children, etc. Thank you for the beautiful minute of calm after a long day of teaching 13 and 14 year olds. I needed to escape to Venice, even if it was just in my minds eye, alone. Gianni, I liked the story very much – you should do more of that! Mr. Larios, I thank you for posting such a wonderful story behind your photograph. I have just started a blog with my wife called Postcards (http://hmbphoto.wordpress.com), but I have never written much, but it’s a thing I would like to do more of. Your story was very inspiring. I also liked the story about lugging all your gear up a hill at 7 a.m. to make use of the light. Lot’s of truth in that one. Again, thank you and be sure I’ll be coming back for more. 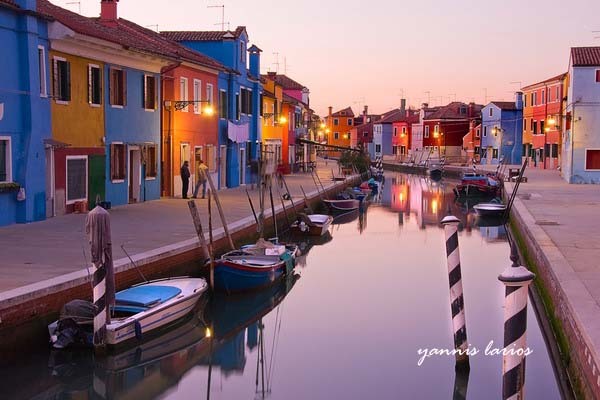 Excellent twilight photo of Burano. Lovely story behind the photo!!!! !i imagine the curiosity of the kids!!!!!! !